← SCOTUS Justice Anthony Kennedy announced his retirement! I just read a story on the BBC about a group of monks in the UK’s Leicestershire monks who are making Trappist beer. There’s a video over there. Mount Saint Bernard Abbey, near Coalville, is only the world’s 12th to get permission to call itself a Trappist brewery. The beer, Tynt Meadow, comes in at 7.4% ABV. Named after the meadow in which monks originally settled on the site in 1835, it will be on sale at the abbey and beer shops next month. The monks began looking at opening a brewery in 2013, after closing down their dairy farm when it became economically unviable. Brothers visited other Trappist breweries – whose beers are regarded as among the finest in the world – as part of their research, and conducted their first experimental brew on St Lutgard’s Day, a saint famous for surviving on bread and beer during fasts. Dom Erik Varden, abbot of Mount Saint Bernard, said he was “very relieved” to see the brewery up and running, and hoped it could help them extend their community work. “Beer is a good, honest, nurturing drink – our Belgian friends said more than once it should be liquid bread and not coloured water, and that’s what we’re aiming to live up to,” he said. Roger Protz, one of the country’s leading beer writers, said the beer was “seriously nice” and should generate “enormous interest” from beer drinkers. 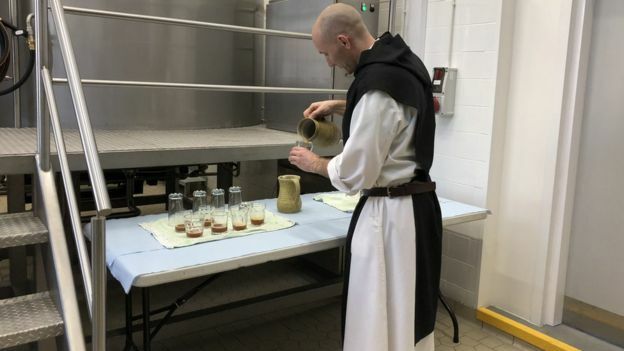 “It’s really very exciting – this is the first beer brewed by monks [in England] since the Reformation,” he said. Get that? Since the REFORMATION! So, this is Counter-Reformation beer! Hence, get lots of beer and share it with your non-Catholic, Protestant friends. This entry was posted in Just Too Cool, The Campus Telephone Pole and tagged beer, Trappists. Bookmark the permalink. One Response to TRAPPIST BEER from MONKS in ENGLAND! I hope the Volstead Act is no longer on the books.